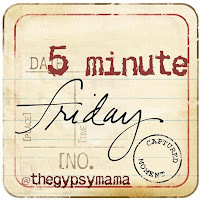 wandering on purpose: five minute friday - "loss"
Joining with The Gypsy Mama for Five Minute Friday - writing for five minutes on a given topic without editing. Five minutes only. Today's topic is loss. The first thing that comes to mind with the word loss is death - loss of a baby, a grandfather, childhood friends. But right behind it today comes thoughts of lost relationships. People who have left, disappointed, abandoned, rejected, betrayed. This is hard loss because I do not understand disloyalty. I do not understand the doing what feels better or convenient or easy instead of the doing of what is right. Most my losses in relationships have happened because of the "head in the sand like an ostrich" way of life. Refusal to confront. Refusal to repent. Refusal to reconcile. It is hard to mourn these losses like mourning a death. A death is awful, tragic, and final. The brokenness of the other type is confusing and frustrating and without closure. And I find myself even at a loss for words now. So, so, true. I can think of one relationship that I have had that was ended for reasons unknown to me. A relationship that was several years in the making. I am always thinking about her, wondering WHY or trying to figure out if I should reach out to her AGAIN. tough. I always thought that "when I grew up" I wouldn't have those kind of friend issues, but in many ways, relationships are even harder as adults. They take a lot more work. And I'm learning that although I always want to work to resolve problems if I can, some friendships were only able to manage any level of real intimacy and closeness for just a season. I've had some times where I knew I'd done everything God told me to do but the relationship just couldn't be restored to the way it was. That's hard and it hurts. So true, losing someone because of a misunderstanding, or some kind of painful interaction. I have had this happen too. It is hard to know what I have done sometimes. Sometimes it has been my feeling less connected to the person and working at the friendship is really hard work. I just have gotten tired of trying. *nodding* Your words touch a deep chord as that is what I'm wrestling with too.